Gramlingville: Kevin goes to school! Last month, we confirmed Kevin's enrollment in pre-school, so it's now official: as of this morning, Kevin has begun his long journey towards personhood. Also, as of this week, Cristina will return to her teaching position at the federal university. This entire week is adaptation week. Basically that means he will only have class from 8-10 am; and a parent must stay with him the entire time. They say that this is so the child has time to adapt to the new routine, and to being in school in general; but in many cases (such as ours! ), I think it's just as much for Mom to adapt to the new routine! This morning, Cristina has taken him, so I am waiting to find out how it went. I expect it will go well: in fact, I won't be surprised if she has to fight him to make him leave at 10 am! Tomorrow it will be my turn, since Cristina has class in the morning. I'm actually kind of looking forward to it, since it's something I missed out on with the older kids. It wasn't easy to get to this point; Cristina has been very insecure about "letting go". I know... it's just pre-school ... not like were sending him to boarding school in Europe or something! But I am not sure if she is ready to face the adaptation process: i.e., the possibility that, after this week, it may be necessary for us to occasionally walk away and leave him crying in the classroom. Her experiences with James and Christian were somewhat traumatic, and I'm not sure how ready she is to face that again. I wasn't very present during this process with the other two (since their classes were in the afternoon); this time, depending on how things work out, I may end up being the one who has to take Kevin to school. Hopefully this attempt will be more successful than the last one: in early May of this year, after much soul searching (mostly by Cristina! ), and considerable research into the options in our area, we had decided that it was time. Cristina's confidence level with respect to the older kids' current school (where they both started in pre-school as well) was at a low level... the number of students has grown considerably, and our impression was that it has relaxed its standards somewhat; the student-teacher ratio has increased significantly, and the school is showing signs of overcrowding in its classes. Then Cristina stumbled across "Sol de Manha" ("Morning Sun"), another school which seemed to have most of the right ingredients. The only downside is that it would be totally new for us: we don't know the teachers, or really anyone who has kids there. By contrast, we've been around the kids' current school for over a decade (since Bruno started out there in pre-school). Nevertheless, Cristina visited the new school a couple of times and liked what she saw. Kevin seemed to enjoy his visits as well: steeling her resolve, she made the leap, and signed Kevin up. She even bought his uniform and lunch box. 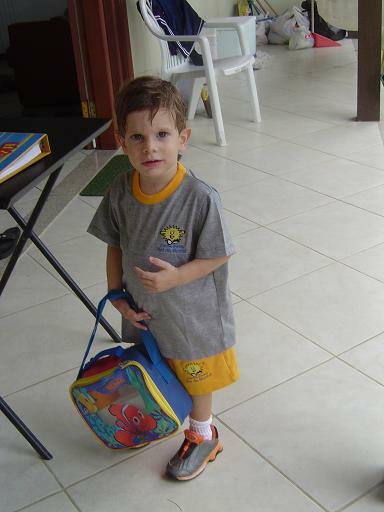 The picture above is not from today: it shows Kevin on his way to his "first day" of school at Sol de Manha back in May, excited, happy, and enthusiastic as he headed to the car. Fifteen minutes later, Cristina called me-- but not from school! It seems that the entrance to the club we frequent is near Kevin's new school. As they passed by, Kevin recognized it and so flexed his vocal cords in favor of a change in plans. After all, he is a two-year old. The terrible twos! If he wasn't spontaneous, authoritarian and belligerent it would mean there's something wrong with him! But the creeping tentacles of guilt that Cristina was trying to suppress surfaced with a vengeance and wrapped around her conscience, and suddenly her conviction, her certainty -- evaporated almost instantly in a cloud of remorse. She turned the car into the club and revoked her decision: Kevin could wait until next year (or at least, next semester). Turns out we only delayed it until August (today), which in the end was probably a wise decision: I sense that both Cristina and Kevin are more prepared now then they were back then. In fact, Kevin is currently undergoing an explosion of language skills. Cristina also went back to the original school and, after a number of meetings and even visits to the classes, they managed to renew our faith in their commitment to pre-school education. As a result, today Kevin is going to the same school as his older brothers, which should tremendously help his adaptation process. I guess that's all for now... tomorrow I will post an update as to how it went! I took Buddy to doggie day care for the first time last week and we were like Jackie Coogan and Charlie Chaplin. The teacher literally wrenched him from my arms while we both cries. Actually, if I could send Sam to doggy daycare that would be fantastic. I wish we had that down here! Come to think of it, I would prefer "doggy boarding school"... they could send him back when he has an advanced seeing-eye dog degree or something.